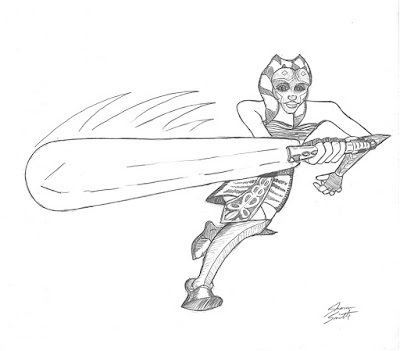 I like the Ahsoka Tano character from Star Wars: The Clone Wars so much that I drew this up. It is just pencils and photoshop. As a dad of a six year old girl I am painfully aware that there are very few female action characters a girl can be interested in so Ahsoka is pretty cool to me. Other than Kim Possible or Hermione there isn't much adventure for girls once you outgrow Dora the Explorer. 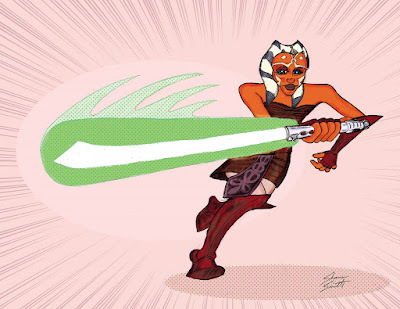 I really like Ahsoka's character design and the color pallet. I like that she looks like a girl. If American mainstream comics artists had designed her she would have huge breasts and would not appeal to young girls in anyway. I thought Ahsoka was probably the coolest thing about the Clone Wars movie (well, Obi-Wan was pretty freaking cool too) and I'm looking forward to the TV show if for no other reason than my daughter will have a girl character that she is interested in other than Hannah Montana and Barbie. Here is a look at the pencils before I started the photoshizzleing. Hey Star Was fans (especially the kids) you can get your very own free sketch of a Star Wars character (or anything else) by playing MailCon. It's free! (Sort of.) Click here to find out how! Wow, that's some really bitchin' artwork. I remember when SW.com started selling Ahsoka t-shirts. I love the action pose. Thanks! It was fun to draw. When I draw lightsabers I can't help but make the vwoooosh sound. I've decided to draw more things that cause my inner child to make my outer adult emit odd noises.